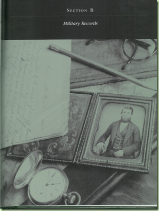 I recently discovered this book: Genealogical Research at the National Archives of the United States. 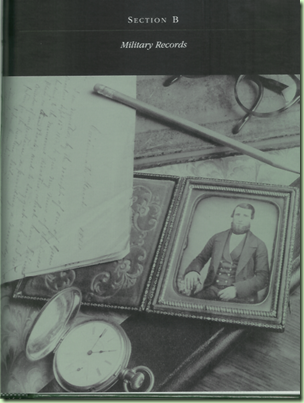 In section B, on page 140, there is Table 9 titled "Microfilmed indexes and compiled military service records for Union Army Volunteers". In the narrative on page 139 it says "...Filming of these records is continuing so researchers should consult the reference staff for latest availability." The book was published, I think, in 1983, so I would have thought that filming of these records must have occurred sometime in the last30 years. My question is two part. Is there a current 'table' referenced above? 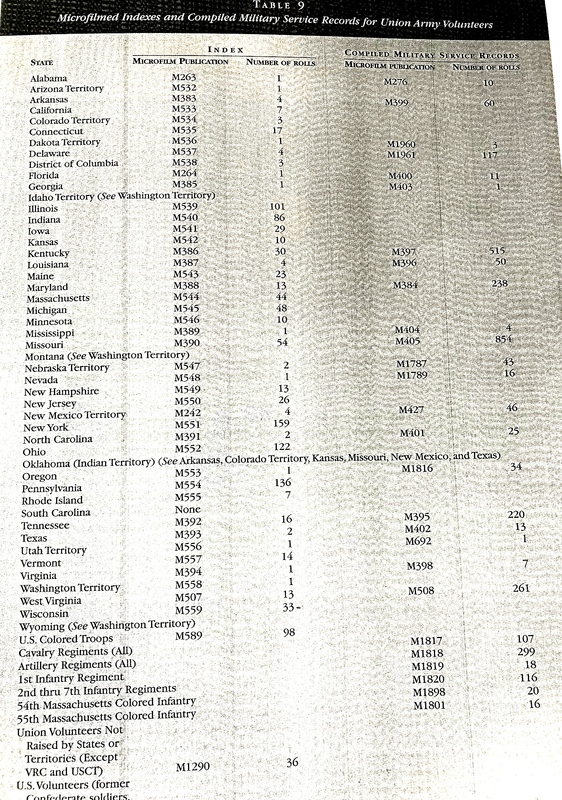 In particular I'm interested in - NOT the INDEXES - but the compiled Military Service Records for the following states: Iowa, Illinois, Minnesota, and Wisconsin. As you can see in the table there appear to have not yet been filmed at the time of the publication. Does anyone have knowledge when these records will be microfilmed and/or digitized? All of my Civil War ancestors served in volunteer regiments from these states. There are allot civil war records pertaining to Wisconsin online. I too have had relatives who served in Wisconsin, Minnesota, Iowa, Ohio during the civil war. Have found all my ancestors on the Wisconsin side within the regiment listings of soilders who served in those regiments. If you need I can try to provide you with a link. Let me me know. Thanks for your post. I too have found a great deal of information on CW soldiers within these states. My question is more specifically about when/if these states will be available online like the others. I'm currently hosting a Facebook Group called Norwegians in the Civil War. We have just over 100 members since it started just a month ago. Many of them, are in the same situation - ancestors who came from MN, IA, and WI. That said, if you have links you can share, that would be nice. The CMSR collection has been digitized significantly since 1983. However, the states you mentioned have not yet been scanned into Fold3.com, only the index cards have been digitized. You may request the CMSR records in person in Washington D.C. or order online. Alternatively, many researchers have pulled CMSR for their genealogy and have scanned the records in our Innovation Hub in Washington D.C. The Innovation Hub is a pilot project where researchers can scan military CMSR or pension files for personal use but they are also saved to our catalog. There is a small chance that your relative may have been scanned by another researcher to the National Archives catalog. I hope this information is helpful. Best of luck with your research! Thank you for replying to my question. I did, as you suggested, and went to Innovation Hub to search for the possibility of a scanned file. I was a bit overwhelmed by the number of results: 7,716 results ! Once I figured out how to 'drill down' I was able to find a CMSR for a soldier in the IA 12th, Co. G. I have since written a FB Group post about the finding. There is VALUE in looking at a soldiers company 'peers' records. I recently found 71 page PDF for Andres A. Egge (aka Pvt. Anders Anderson) with the IA 12th, Co. G. It had been scanned and PDF'ed by Geoff Egge (assumably a relative). Geoff participated in a new pilot project called: Innovation Hub - a place where researchers can scan military CMSR or pension files for personal use but they are also saved to our catalog. Once saved, they are available to anyone to view. In reviewing the file I discovered the following peer soldiers (Gustav A. Hague and Anton E. Anderson) who provided handwritten affidavits stating that they knew the 'soldier in question' and talked about their shared experiences in Company G. Their signatures can be found in the file. That said, I'm still wondering about the second part of my question. That is, what is the plan to film / digitize the states I mention - not yet been scanned into Fold3.com. Or should I say, IS there a plan to scan these states?? And if so, an ETA? Might you know the answer to this question? It is not entirely clear on when those state military records will be released electronically. However, here is a link to NARA's strategic plan to digitize a majority of our holdings. the best suggestion for now, is that you continue to search our catalog for the soldier's CMSR or Pension files. I coincidentally found another link today regarding immigrant soldiers and naturalization. It may be of value to review? www.naturalizationrecords.com - Special Cases. Substitute "compiled military service record" or "bounty land" for "pension" if you're looking for those. Will do my best to get link over, also my grandfather's parents came from Norway to Wisconsin they have allot of information on them. But many looked like they came after the Civil War, my fathers side are Dutch and they settled in Pennsylvania, Ohio. My great grandmother was from Iowa she is a Parr, and are all related going back to Catherine Parr, King George's like 13th wife. But will definitely gets some information together.